Ladies and Gentlemen… let me tell you: Spring is finally upon us! And it was about time – don’t you think? Can’t believe how quickly the seasons have changed to be honest – one day we have snow and freezing temperatures and just about 4 weeks later London is blessed with 30C and sunshine. Seems like it went straight into summer! London has finally gotten the memo though and adjusted back to spring – phew! Whilst I like summer, spring will forever be my favourite season of the year – all the blossoms, the air filled with excitement, longer days and the first warm rays of sunshine – I can’t imagine anything better than this. Don’t you agree? As a reminder: in 2018 I am bringing you 1 Appletiser inspired recipe a month. How do you get inspired by a drink, you might ask? Well, let me tell you that all of these recipes are free from added sugar and also contain 1-of-your-5-a-day – just like the tasty Appletiser drinks! Magical, huh? 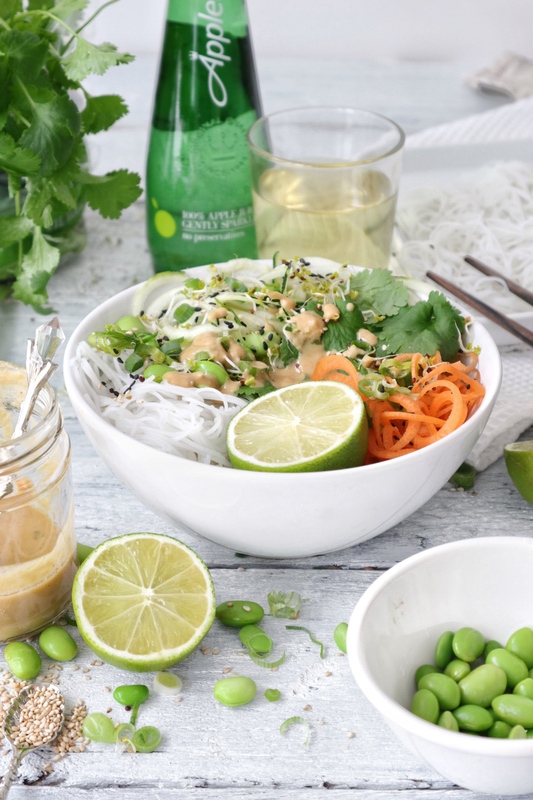 This month I have also been inspired by the wonderful weather changes and finally wanted to get sunshine back on the plate with a refreshing dish – and this is how the idea for a Vietnamese Noodle Salad came up! And it’s super quick & easy to create! Start by placing the Rice Vermicelli into a bowl and add hot water until the noodles are completely covered. Set aside and leave to soak until the noodles are softened. In the meantime spiralize the carrots and the courgette. 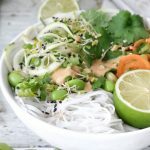 Don’t worry if you don’t have a spiralizer at home – you can alternatively cut them into very thing strips or shave them into thin layers using a potato peeler. 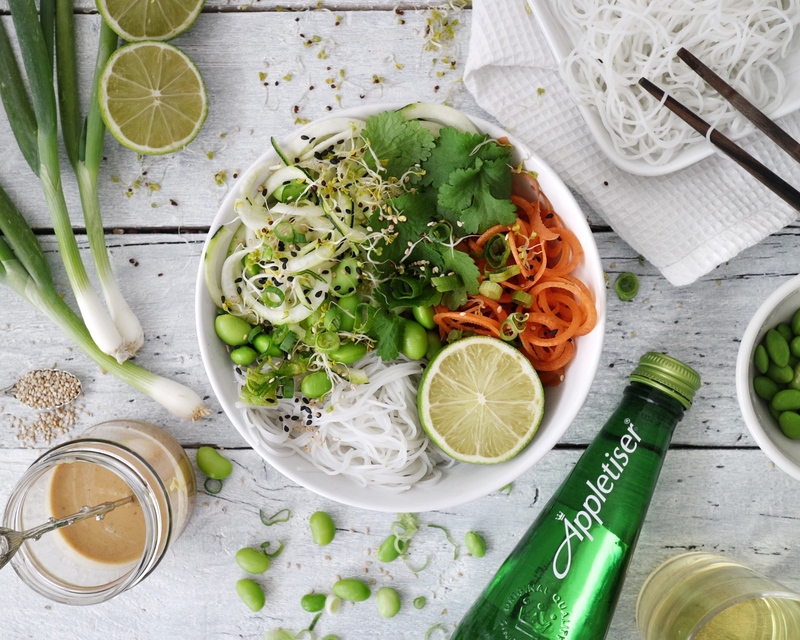 Wash the coriander and place it in a bowl together with the soaked Vermicelli, courgette and carrot. Add the Edamame Beans. Combine all ingredients for the dressing in a blender and blend until smooth. Add your toppings to the salad and add 1/2 lime to the corner of the bowl – it’s great to drizzling the lime juice all over right before taking the first bite. 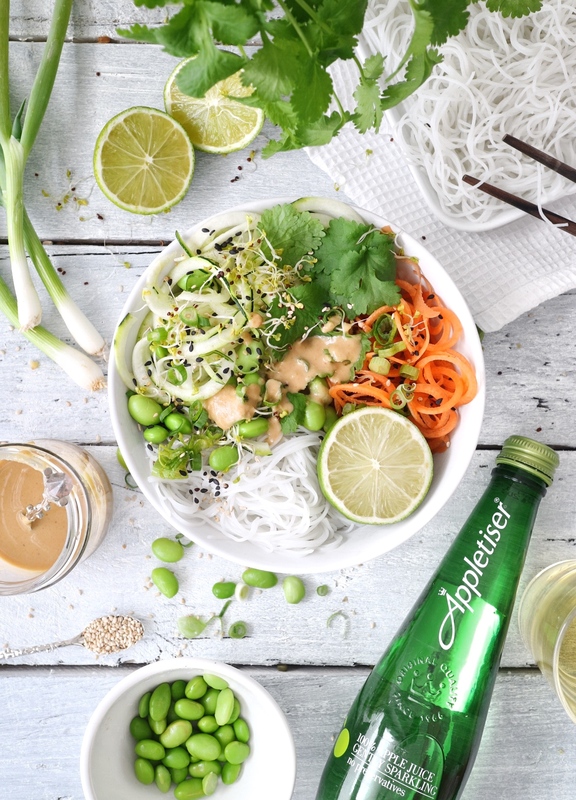 Drizzle the dressing on the top, add the crushed peanuts (optional) and you’re ready to go! Enjoy with a cold, fresh Appletiser on the side! 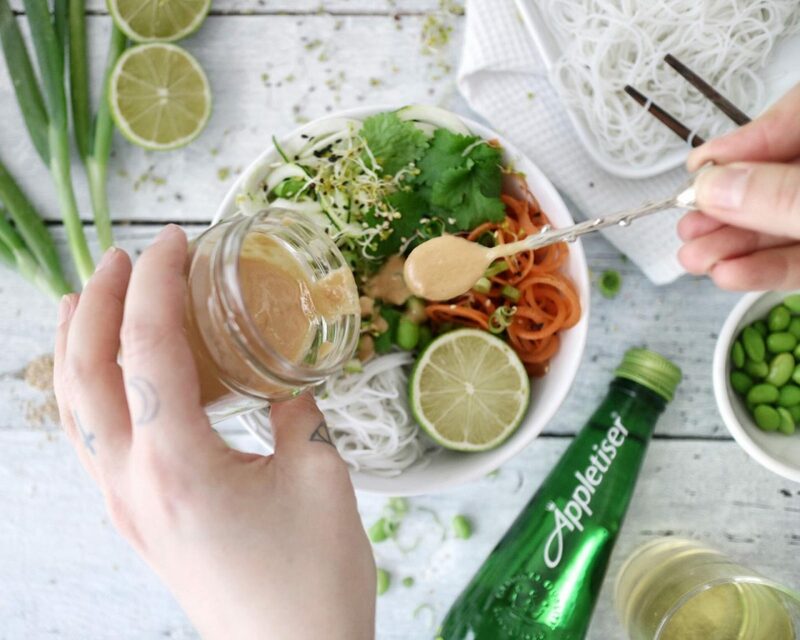 For presentation reasons you can place all ingredients in the bowl next to each other – and when about to eat Vietnamese Salad Noodle, you simply use a pair of chopsticks to combine everything. You can of course combine everything upfront – that’s totally up to you! Excited for the next refined sugar free, 1-of-your-5-a-day recipe? Then keep your eye out: next month is all about beautiful summer inspired dishes!